Italy referendum: Could growing populism lead to EU breakup? Home > Blog > Italy referendum: 'No' vote to boost populist sentiment and lead to the demise of the Eurozone? In late September, we highlighted some upcoming votes in Europe that could have ramifications on the continent for years to come. One of which being the Presidential Election in Austria that could have seen the first far-right leader elected to office in Europe. Polls were too close to call before last weekend, however, far-right leader Norbert Hoffer conceded defeat to his left-leaning rival on Sunday. Nonetheless, as Senior Economist Angela Bouzanis stated in her post in September, Hoffer’s close call highlights growing Euro skepticism and could still provide a symbolic moment for other European populist movements. There are a slew of politcal events coming up in early 2017 that have the potential to derail the Eurozone. On 15 March, the Netherlands will have a parliamentary election. According to latest polls the far-right, anti-immigration, Party for Freedom, led by Geert Wilders, will win more seats in Parliament than any other party. By the end of March, Theresa May is expected to begin negotiations to leave the EU. The negotiation period is expected to take up to two years, however, depending on the nature of the Brexit, be it light or hard, could significantly impact economic sentiment and lead to more anti-EU populist sentiment. Shortly thereafter, on 23 April and 7 May, France will hold presidential elections where far-right National Front party’s Marine Le Pen is expected to at the very least make it to the second round of elections. Le Pen has promised a ‘Frexit’ referendum if she wins, and although Brexit was big news, France is a member of the euro, which would likely represent a bigger issue for the Eurozone economy. Worst-case scenario: Could the Eurozone actually go down? Although according to analysts the “worst-case scenario” in most of these elections is unlikely to happen, nothing can be ruled out after the shock of not only the Brexit-vote, but also the shot heard ‘round the world, as Donald J. Trump was elected President of the United States on 8 November. Carsten Brzeksi, Chief German Economist at ING-DiBa Bank, believes that if just one of the votes goes the way of the worst-case scenario, it has the potential to bring down the entire Eurozone. "Since the 9th of November, times have changed […] I think each [political event] has the potential to derail the Eurozone, to further disintegrate the Eurozone, to maybe possibly even lead to a breakup of the Eurozone — but only in the worst, worst-case scenario." Some analysts believe that concern over the growth of populism has been muted, as global financial markets have been largely stable and even shown signs of improvement since the UK and U.S. shocks. The prevailing view from many was that the global economy would crumble with the election of Trump as well as Brexit in June, however, neither has come to pass and in the immediate aftermath of the Italian referendum, markets in Italy are also stable. As senior investment strategist at Aberdeen Asset Management, Craig McKenzie, puts it, “[These outcomes are] teaching the market that political shocks are not necessarily the start of the next bear market [...] The market is harder to shock." Although it has only been a short time since outcomes of each vote, analysts believe that the not-so-negative effects on financial markets after the votes may have fueled the fire of the populist movements. Austria’s Hoffer had been more ambiguous with his views on EU membership, distinguishing himself from other far-right leaders that unequivocally want out. However, a majority Party of Freedom in Dutch parliament could lead to the Netherlands leaving the EU. Add to that the possibility of Le Pen’s ‘Frexit’ and pro-EU politicians and economists may be getting a bit nervous, especially after the unexpected Brexit and Trump votes. How could the possibility of any of these scenarios affect economic sentiment? This is hard to say. Right now it seems that investors and companies aren’t really expecting a crisis. Economic sentiment in the Eurozone just hit its highest level since December 2015 in October and inched up even further in November. Business confidence in Germany, Europe’s largest economy, jumped to an over 2-year high in October. The Eurozone economy seems to have shrugged off any early Brexit contagion as growth in Q3 remained steady albeit moderate. The common currency bloc grew 0.3% in Q3 over the previous period and the unemployment rate continued on a downward trend in the third quarter. France’s economy rebounded, Italy’s economy picked up steam and Greece’s growth surged in the third quarter. And Spain, despite not having a government for the first 9 months of the year, is still one of the fastest growing economies in Europe. A new European debt crisis on the horizon? Eurozone economies appear to be shrugging off political developments. The common-currency bloc looks to be enjoying moderate growth, just a few years after the 2009-2012 debt crisis that hit, in particular, Southern Europe and threatened to break up the Eurozone. However, a new debt crisis could be on the horizon as Eurozone countries such as France, Spain, Portugal and Italy look as if they will miss debt and deficit targets again in 2016 and possibly 2017 and Italy's populist Five Star Movement may play a big part in that. FocusEconomics Senior Economics Editor, Caroline Gray, argues that the EU will continue to bend its rules to accommodate the growing debt issues in Southern European Eurozone countries to avoid a breakup of the bloc. Commerzbank Chief Economist Jörg Kraemer argues, however, that Italy may be the biggest threat to the EU especially after Renzi’s defeat. Although it would take a pretty unlikely sequence of events to play out, a Five Star government could take power, if not immediately, in the May 2018 general election. According to Kraemer, a Five Star government could increase public spending to the point of busting the Eurozone's rules on deficit limits, adding more debt to Italy's already hefty debt of 133 percent of economic growth. More deficit spending and debt "will create a huge conflict with the fiscal rules and the European Commission," Kraemer said. "And in such an environment there is a significant risk that private bond investors will go on strike and refuse to buy Italian government bonds. That means there is a significant risk that we will see a return of the southern debt crisis if the Five Star movement continues to lead in the polls and there are early elections." Growing anti-EU populist movements and another EU debt crisis could mean another move to breakup the EU. However, at the moment it is all hypothetical, so as is often the case, we will just have to wait and see what happens. To stay in the know, keep checking back with us for the latest economic news, data and forecasts. 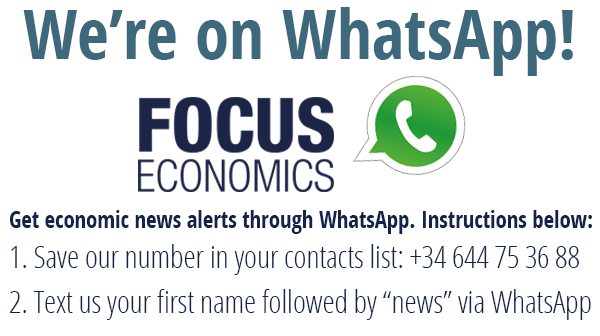 You can also download a free sample of one of our FocusEconomics Consensus Forecast reports by clicking on the button below.